Autumn is finally upon us (I guess technically there's one more month, but who's counting in these temperatures? ), and I am so excited. I love the air - it's crisp, it smells amazing and it's not at all suffocating like the heat of summer. The best part of autumn and winter for me is by far the ability to wear jeans with and to everything - class, meals, parties, going out. Even meetings with my professors since dark jeans can look unbelievably smart. 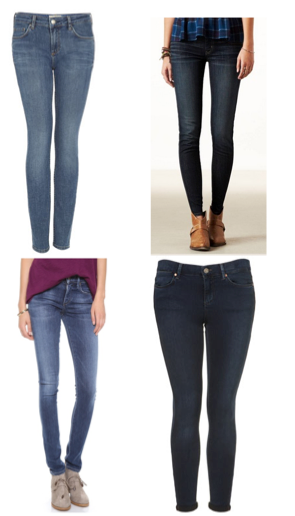 Here are my picks for jeans this fall, specifically chosen for colour and length - I'm fairly petite in the length department! There is nothing I love more than a great pair of skinny jeans and a big comfy sweater. What are your favourite jeans for fall?